The findings intimate that people who are worried that they might be too old or inept to start resistance training should perhaps try it, to see how their bodies and minds respond. We already have plenty of evidence, of course, that weight training can help us to age well. By our early 40s, most of us are losing muscle mass, at a rate of about 5 per cent a decade, with the decline often precipitating a long slide toward frailty and dependence. But lifting helps only those who try it, and statistics indicate that barely 17 per cent of older Americans regularly lift weights. To start, they turned to 81 older men and women who were part of their health database and who had agreed to begin resistance training. These volunteers were all between the ages of 65 and 75 and, like many Finns, healthy and physically active. But they did not lift weights. For the full study, they began a twice-weekly programme of supervised, full-body resistance training at the university to familiarise participants with proper technique and to build a base of strength. After three months, the group was randomly assigned to continue training once, twice or three times a week, while a separate, untrained group served as controls. Periodically, the researchers checked the volunteers' strength, fitness and metabolic health, and also their attitudes about the workouts, including whether they found them daunting or inviting and how difficult it was for the volunteers to find the time and resolve to show up. But then, after the months of supervised lifting, the exercisers were abruptly on their own. 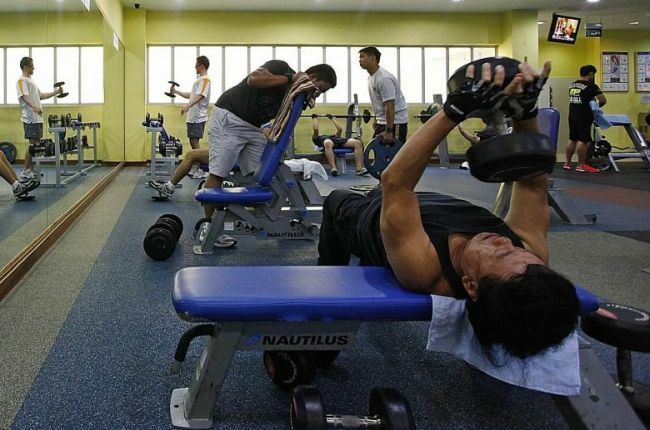 The researchers explained that they could no longer have access to the university facilities and provided them with information about low-cost, suitable gyms in the area. But any subsequent training would be at their own volition. They found, to their surprise, that a year after the formal study had ended, almost half of the volunteers were still lifting weights at least once a week. "We had estimated a rate of 30 per cent," said Tiia Kekalainen, a project researcher at the University of Jyvaskyla who led the psychological study with the senior author, Simon Walker, and others. Also surprising, the researchers discovered little direct correlation between muscle and motivation. The people who had gained the most strength or muscle mass during the study were not necessarily those most likely to stick to the training. Instead, it was those who had come to feel most competent in the gym. If someone's self-efficacy, which is a measure of confidence, had risen substantially during the study, he or she usually kept lifting. In effect, Kekalainen said, people who discovered that they enjoyed and felt capable of completing a weight-training session subsequently sought out and joined a new gym and showed up for workouts, despite no longer receiving nudges from the researchers or encouragement and companionship from their fellow volunteers. "They found out that resistance training is their cup of tea," she said. "They could do things that they thought they could not do before," she said. Of course, about half the volunteers had told the researchers that "they preferred other types of exercise," Kekalainen said, and those men and women, for the most part, no longer lifted weights. The researcher and her colleagues hope in future studies to explore the issues of what drew some people to the lifting and left others uninspired, and how weight-training routines might be structured to appeal to the sceptical. For now, people interested in starting to lift weights should look for classes or trainers specialising in beginners and learn to lift safely. But the overarching lesson of the study, she said, is that to discover how you feel about weight training, you need to weight train.